What can I do to prevent heart disease and stroke? What can happen when blood vessels are clogged? 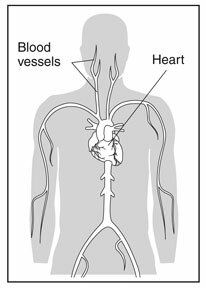 How do narrowed blood vessels cause high blood pressure? What can I do to prevent or control PAD? High blood glucose can cause heart and blood vessel problems. To find a diabetes teacher near you, call the American Association of Diabetes Educators toll-free at 1-800-TEAMUP4 (832-6874), or look on the Internet at www.diabeteseducator.org and click on "Find an Educator." To find a dietitian near you, contact the American Dietetic Association at www.eatright.org and click on "Find a Nutrition Professional." The National Heart, Lung, and Blood Institute (NHLBI) is part of the National Institutes of Health. To learn more about heart and blood vessel problems, write or call the NHLBI Health Information Center, P.O. Box 30105, Bethesda, MD 20824-0105, 301-592-8573; or see www.nhlbi.nih.gov on the Internet.